Designing a boat is an art. It requires a subtle mix of creation, knowledge, audacity and rigour. Jean Berret and Olivier Racoupeau started out by forming a good team. 10 years later, in 1983, they became partners to found Berret-Racoupeau Yacht Design. At the foot of the towers of La Rochelle, their naval design and architecture office quickly expanded and some 15,000 boats by BRYD are now sailing. Guided in any project by their very personal view of shapes and aesthetics, the BRYD team takes balance in stability, balance of lines, and balance of costs into consideration in all its developments. Designing a boat is a complicated process in which science, experience, creativity, and artistic flair come together. A large part of the work of the BRYD naval architects, designers and engineers is based on considerable expertise combined with unsuppressed intuitive flare. Investigation work confirms the merits of these intuitions and helps to develop them, while perfectly controlling the physics of the boat. The naval architects’ job must adhere to three chief principles governing the design of sailing yachts. These are performance and attention to balance, overall harmony and ergonomics, and a strong structure withstanding mechanical forces. BRYD’s philosophy is to always design a boat that exceeds customers’ expectations. In 1978, Jean Berret designed his first Beneteau sailing yacht, the First 35 and then the First 32. Many Oceanis yachts followed, as well as the creation of the Sense range. BRYD has a strong historical connection that unites it with the brand. 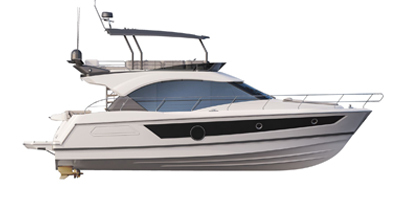 It also designed several custom CNB yacht projects for the group. Olivier Racoupeau : Since the First 35, we have always had projects in progress with Beneteau. We have never ceased to work very closely together with the teams, for nearly 40 years. On some projects, part of our team moves into the design office in the weeks before the project is finalised. Beneteau is the only client we work with in this way and there is a very strong collaboration between teams. Our most recent project for Beneteau, the Oceanis Yacht 62, has been a wonderful challenge that will take this historic range into the world of large yachts – a world we know well. Olivier Racoupeau : The ‘Evoe’ project for CNB is a project we felt particularly strongly about. It was a highly innovative custom 180 foot sailing yacht concept, particularly in relation to its deck plan. This boat never came to be, but it was behind the Sense project at Beneteau. Adapting a project as innovative as this for a boat yard is an exciting process. Beneteau wanted a sailing yacht whose architecture did not exist elsewhere: a monohull opening completely onto the sea. The challenge was difficult, but it is indisputably one of my favourite projects! It is both amusing and quite flattering to see that Hervé Gastinel, the group’s managing director, is now the owner of one of these boats. Moreover, I attended the Beneteau Yacht Rendezvous in Formentera and it was extraordinary! It is wonderful to see customers happy with their boats.